Multiple Intelligences Test section includes Learning Styles Test options for career, leadership, work, partner purposes. 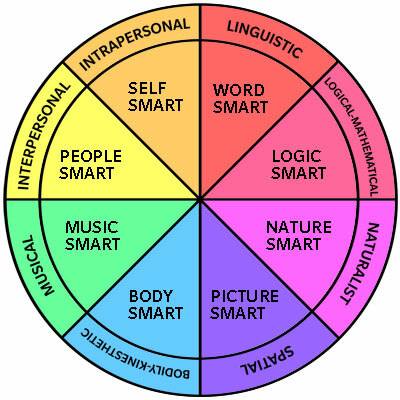 Multiple Intelligences, according to Howard Gardner, are behaviors associated with specific brain function that meet 8 key criteria (see wikipedia). These include musical rythmic, spatial, verbal - linguistic, logical mathmatical, bodily kinesthetic, interpersonal, intrapersonal, naturalistic and later added moral (see image below). Learning Styles are the channels by which your acquire and recall data. Many tests include these styles and some offer information about more learning styles. 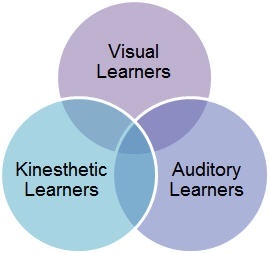 The image (below) depicts the primary learning styles. Most Multiple Intelligences and Learning Styles Testing is used for academic and educational purposes. TestEts offers multiple intelligence tests and learning styles tests for career and college purposes as well. In other words, you can find career that utilize your unique combination of multiple intelligences to augment your chances of success. - Find Multiple Intelligences test and Learning Styles test for Students and Adults to test 6+ multiple intelligences and test various learning styles for career, college and academic purposes.